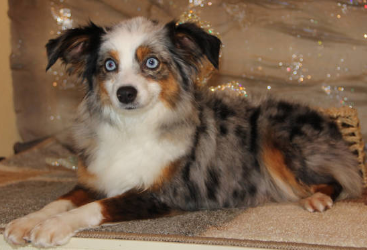 Blue Merle Toy dam with 2 ice blue eyes & rich merle coat. Parents are Gumdrop & Porter. 4th Generation Tug@YurHart Toy Aussie. She weighs 10 pds. and stands 10" tall. Black-tri Toy dam (pictured on left, Coal Country on the right). Parents are Laila & Junior Mint. 4th generation Tug@YurHart Toy Aussie. This girl's copper is such a striking orange. Bubbly personality thus "Bubbles" had to be her name! She weighs 9 pds. & stands 11 inches tall. 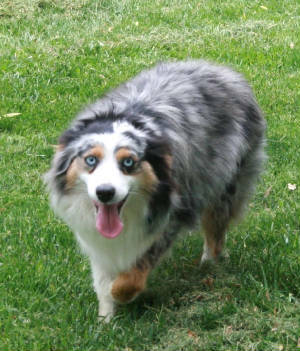 Blue Merle Toy Dam with 2 ice blue eyes. Parents are Int'l Ch-Sired Gummi Bear & Reeses. 4th generation Tug@YurHart Toy Aussie. She is 10 pds. Full sister to Kansas. Black-tri Toy female. Parents are Int'l Ch-Sired Redneck Country & Alaska. Bitty stands 8 inches tall and weighs 7 1/2 pds. 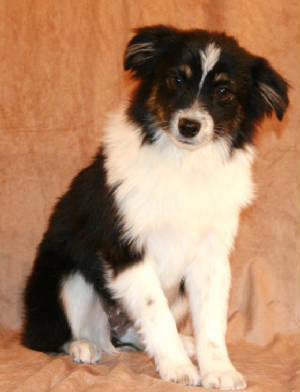 Black-Tri Toy, parents are Int'l Ch-Sired Gummi Bear & Licorice. Super thick boned Toy, short backed, good ear set and deep working coat with rich copper markings. She is 10 # & 11" tall. 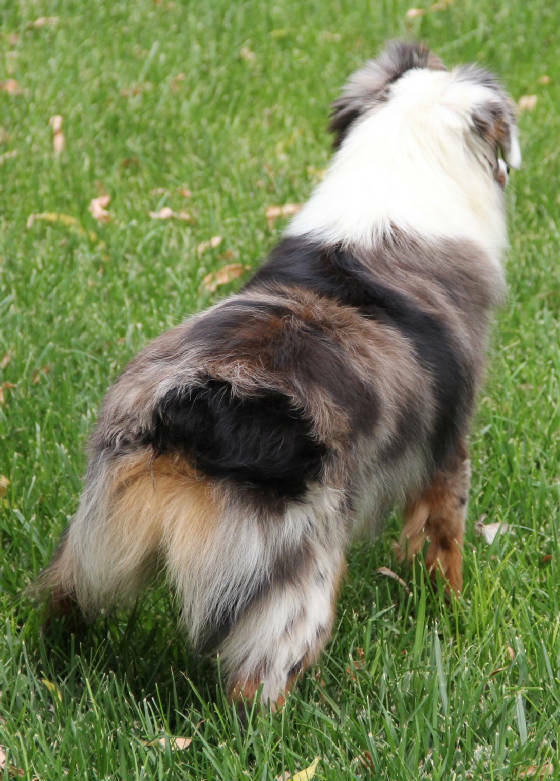 3rd generation Tug@YurHart Toy Aussie. Black-tri Toy dam, sired by Sidekick & Twix. She is 8 pds. with a shorter back and thick set bones. 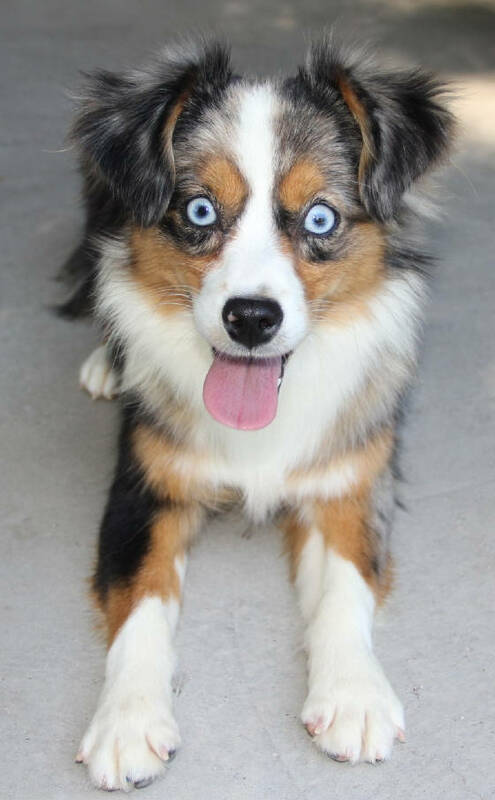 Harlequin Blue Merle Toy with 2 blue eyes. Parents are Laila & Porter. 4th generation Tug@YurHart Toy Aussie. She is 11 inches tall & 10 pds. She is a black-tri female. Parents are Int'l Ch-Sired Redneck and Alaska. Kadie weighs 10 pds. and stands 12" tall. 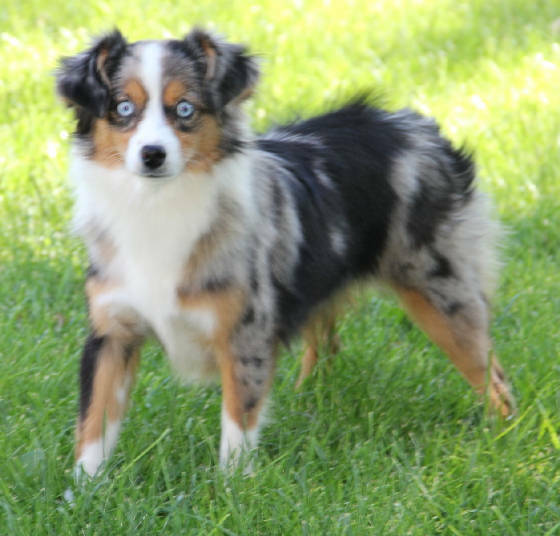 Striking blue merle female with rich copper & 2 ice blue eyes from Int'l Ch-Sired Gummi Bear & Paige. Icee is 13 pds. & 12 1/2 inches tall. Black-tri Toy dam. Parents are Int'l Ch-Sired Redneck Country & Rainee. *Full sister to Firefox. Izzy is 10 3/4 inches tall & weighs 10 pds. She is a nicely proportioned girl. Gentle natured and obediant. Red-tri Toy dam. Parents are Int'l Ch-Sired Redneck Country & Rainee. 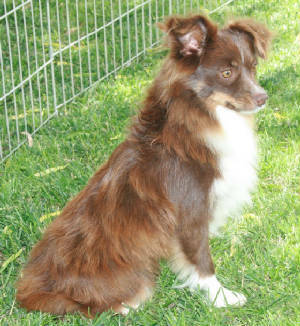 The deepest red we have ever seen on an Aussie with gorgeous rich copper markings. Fleck of blue in her eye. Amazing proportions at 11 inches in height & 10 1/2 pds. 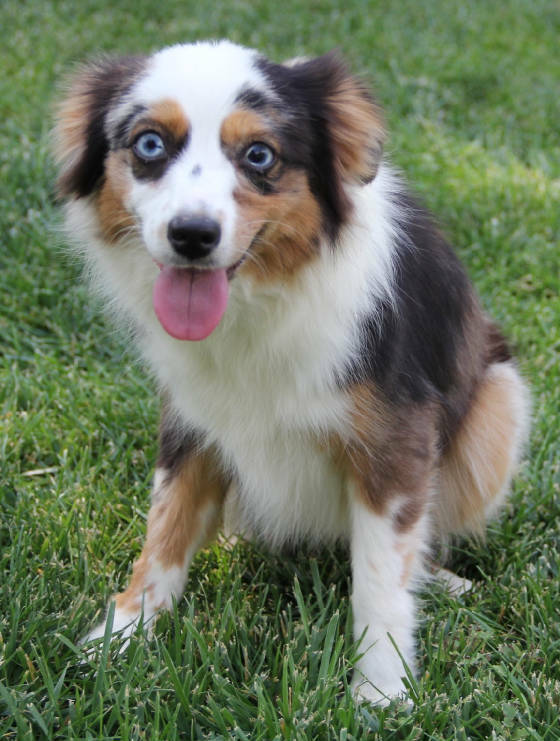 She is 5th generation Tug@YurHart Toy Aussie! 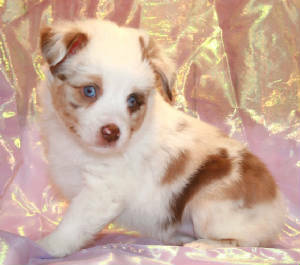 Blue Merle Toy dam with 2 ice blue eyes. Parents are Int'l Ch-Sired Redneck Country & Prairie Girl. She is 12 1/2 pds. & 12" tall. Colorado's state flower is a beautiful Columbine. 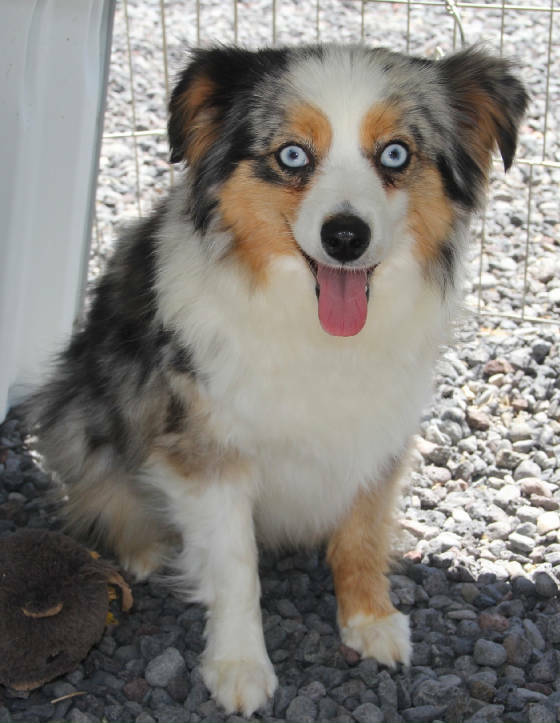 Our Columbine is a beautiful blue merle with rich copper & ice blue eyes. She is red factored at 13 pds. & 12 inches tall. Parents are Int'l Ch-Sired Gummi Bear & Firefox. Black-tri Toy dam. Sired by Salt-n-Pepper & Ruby. She is 12 inches tall & 10 3/4 pds. 5th Generation Tug@YurHart Toy Aussie. Beautiful girl who doesn't know a stranger! Loves her people! Red-Tri toy dam, sired by Int'l Ch-Sired Redneck Country & Laffy Taffy. She is the beautiful deep liver red at 12# & 11 1/2" tall. Our 1st Tweed (4 shades of red) Red Merle Toy dam, sired by Reeses and Patriot. Standing at 12" tall and 15#. She is thick boned, nice ear set along with two beautiful ice blue eyes. 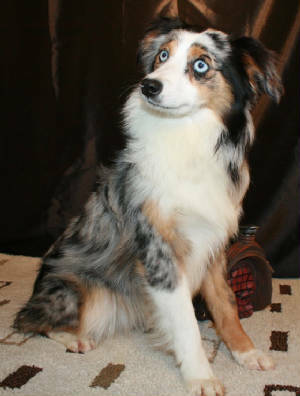 She is a beautiful blue merle with rich copper & ice blue eyes like her sister Columbine. Weighing 11 pds. & 11 inches tall. Parents are Int'l Ch-sired Gummi Bear & Firefox. Ruby is a deep liver Red-tri with rich copper markings Toy. Parents are Int'l Ch-Sired Gummi Bear & RedHot. 4th generation Tug@YurHart Toy Aussie. She is 13 inches tall & 13 pds. Also "Peg Peg or Winnipeg" What a fun name she has, comes to all 3. Our large Toy Black-tri. She is full sister to Paige. Mom says, "Freckles(ticking) are special" and I have black ones and tan ones! She is 19# & 13". Black-tri female with thick-set bones like her sire, beautiful classic markings with rich copper. She is 13 inches tall & 18 pounds. Black-tri female who is a small Mini Aussie. She is 17# & 13 1/2" tall. Her parents are Int'l Champion Sired Gummi Bear -n- Licorice. This girl is super thick boned, thick deep coat with the perfect head and ear set that you would find in a standard Aussie. Black-tri Toy dam with rich copper & 2 brown eyes. 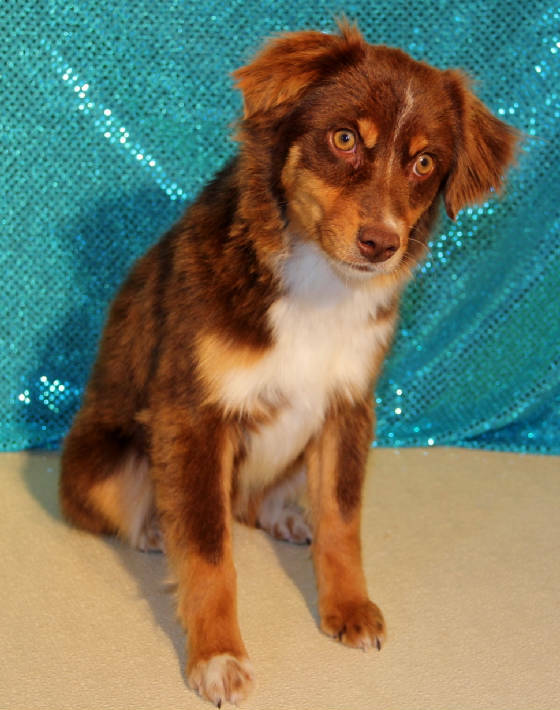 Parents are Int'l Ch-Sired Gummi Bear & Reeses. 4th generation Tug@YurHart Toy Aussie. She is 7 pds. Full sister to Alaska.